It is mid day, Jaken hands Lord Sesshomaru a rolled up scroll and informs, " Milord, The demon ruler Zeref has sent a message to all rulers. He is requesting that each region send their strongest demons to fight with his empire for his next upcoming battle with an old enemy that is trying to over throw him and take his place as Eastern ruler. In exchange he says he will provide human servants for the castle." Sesshomaru responds, " I have no desire to assist a filthy demon such as he. It is a refreshing thought to know that there may soon be a replacement ruler for the Eastern Lands. Dispose of the request Jaken." "Yes Milord." As Jaken goes to get rid of the scroll, he over hears some of the other demon servants of Sesshomaru's empire talking about who is the strongest of all his servants. One demon replies, "Isn't it obvious, next to his son....I am his most Elite fighter. I am always the first to be called upon when there is a threat to the kingdom." Another demon says, "You may fight well but you are hardly his most elite, Fajinta....now he wins battles. Lord Sesshomaru always looks to him during times of hardship." The first demon responds, "That may be so, Fajinta may gain favor over Lord Sesshomaru before I but at least I am considered one of his top fighters, but You are of no use...You are as helpless as Jaken...haha." Jaken hears this and his eyes raise as he thinks: Whaaat, I am useless!! The other demon responds, "That was a low blow, no demon here is THAT weak and helpless." The demons begin walking away as Jaken feels anger and yells at the demons who are no longer with in range to hear him. "You fools don't know what you're talking about, I am Lord Sesshomaru's most trusted and devoted servant, Ugrrr!!" He storms back into the castle and back to the throne where Lord Sesshomaru is sitting as he informs, "I have gotten rid of the ridiculous request as you have ordered my lord." Sesshomaru again orders, "As a response, send two of my flying demon servants to the East, have them forward this message to Zeref: He need not waste his time requesting favors from an enemy such as myself who would be glad to see his kingdom fall. What a fool he is to provide crucial information about his empire." Jaken wanting to show how useful he can be replies, "Milord, I will have the demons fly to the East but please allow me to go with them and do the speaking on your behalf. I will put him in his place if he has any snide remarks in response to your message." Sesshomaru responds, "You will only get yourself killed, Now go and carry out my order." Jaken is most disappointed of this answer as he walks off to follow his master's instructions. Some time goes by and Jaken is back inside the castle speaking with Rin and Nephra as they both work on two lovely Kimonos, Rin says, "Sango's daughters are going to love these Kimono gowns for their birthday celebration. Master Jaken, isn't this fabric just beautiful? Here feel how soft." Jaken feels the fabric of the kimono they are making but says nothing as he is feeling a bit depressed. Rin continues speaking about the birthday celebration. " Oh, I remember my birthday celebration...It was such a wonderful event. I defeated my very first demon that day, do you remember Master Jaken?" Jaken sighs, "Yes, Yes." Nephra asks, "What's wrong Jaken? You seem down about something." Rin adds, "Yes you do seem blue, What ever it is you can tell us." Jaken responds snappy," Oh it's nothing either of you can help with....Why am I wasting time here?! I should be doing more important things for Lord Sesshomaru!" He walks off as Nephra shrugs confused at Jaken's mood ; she continues talking to Rin, "Mother, do you think we got the measurements correct, Chiora has a very small build." Rin responds, "It will be fine, she's only a bit smaller than you, so if..." Rin stops in mid sentence as she sees a section of the Kimono start to slowly unravel, she is confused and Nephra gasps as they both look up. Jaken is unaware that a piece of thread from the Kimono is stuck to his claw as he walks away the threads unravel and the Kimono tears and snags. Rin and Nephra yell out in unison, "JAKEN!!" Jaken turns swiftly and replies, "What,, What.. What is it!!" Rin replies, "Look you've ruined the Kimono...the birthday celebration is in two days and now we have to start this piece over." Nephra adds, "It looks like we will have to stay up late to fix it mother." Rin yells at Jaken, "Master Jaken, you're so clumsy....You always have been!" Jaken replies, "Give me a break would ya, I didn't do it on purpose!" Rin agrees, "Alright no need dwelling on this. Nephra, we'll take a break and get started in a while...we've got a long night ahead." Nephra responds, "Ok Mother." Rin goes with Jaken down to her husbands throne and as they go down the stairs, they both see Heroshya is there with his father. Rin immediately greets him, "Hello Heroshya, I'm glad you're here. Will you stay for dinner?" He responds, "No lady Rin, I actually just came to pick a bone with the Imp....Hey Jaken,....There's a nick in my sword from when you sharpened it last." Jaken replies, "Impossible, I always double check the swords after I sharpen them....No one could do a better job." Heroshya replies, "Heh, So you say....Now I won't be able to fight in the Northern Tournament tomorrow, my team has to forfeit." Sesshomaru inquires, " Will you not take it to a bladesmith. I'm sure it is an easy fix." Heroshya responds, " I did, It'll take 2 days to fix." Rin replies, "Oh I'm sorry Heroshya. What about your other sword?" Heroshya shakes his head, "No I can't win a battle with that sword, I only use that one for little fights, never in a tournament. Oh well, I guess I'll have to let my team know we won't be fighting tomorrow." He begins to walk off out of the castle as Zephra comes from the dining quarters of the castle and informs her mother and father, "I won't be home for dinner tonight, I'm going to spar with a friend in the meadow for a bit." Rin asks, "When will you be back?" Zephra informs, "'I'll be home by night fall,...I'm taking Au Un with me." Rin gives her okay and Zephra gets ready to walk off when Jaken replies, "Oh, don't forget your gloves Zephra...last time you nearly cut your own hand trying to fight without them." She agrees, " Oh, right." She takes the gloves from Jaken and asks, "Uh, Jaken did you remember to get the other item I need?" Jaken asks, "What item, what ever could you mean?....Oh....Yes, Yes of course." Jaken hands her a small rolled up scroll as he mistakenly blurts out, "Ha...good thing you remembered, You won't be allowed into the demon gaming grounds without this." Zephra's eyes raise as she looks up and sees her mother and father with angry, stern looks on their faces. Jaken realizes what he just said, "Uh Oh...I've got to learn not to talk so much..." Sesshomaru speaks sternly at Zephra, "I told you not to go to the demon games, Yet....You have been going anyway!" Zephra replies, "Father....Heroshya goes all the time, why can't I ?" Sesshomaru responds, "No daughter of mine will participate in games involving all male demons." Rin adds, "Zephra, you can not go around trying to do all the things you see your brother doing. He is male and full demon, somethings are not proper for you to do or participate in, especially a female of your status." Zephra tries to argue her point, "But Mother I...." Rin interrupts, "I don't want to hear anymore...... Your father and I are fed up, we're not sure what to do with you Zephra!!" Sesshomaru orders, "I will not have you defy me girl !! You are restricted to the castle for five days." Zephra's eyes raise as she pleads, "But father, I'm suppose to go to the birthday celebration for Lady Sango's daughters in two days. I told them I would be there." Sesshomaru replies in a raised voice, "You are not to leave the grounds of the empire for five days...is that clear?!!" Zephra replies, "Yes Father." as she swiftly turns and angrily leaves to her sleeping quarters as Jaken feels terrible for letting that information slip, he follows Zephra to her quarters and tells her, "Oh Zephra, don't be angry, I didn't mean to tell, it just slipped out." Zephra complains, "With the size of your big mouth an entire mountain could just slip out. Now, it will take me the entire day tomorrow to sweet talk father into letting me go to the celebration." Zephra plops down on her bed and sighs as Jaken leaves her and goes off on his own, thinking to himself: This has been a terrible day, nothing has gone right. Those demons were correct, I'm just worthless. It's apparent I'm not really needed here and I'm just a nuisance to everyone. Perhaps It would be best if I were to just go back to my tribe where I was needed and respected. The more Jaken thinks of this the more he feels that this is the best course of action. He writes a short letter that reads, "To whom ever finds this, I have been unworthy of you all and nothing more than a pathetic servant. I will no longer burden your lives, I have decided to leave for the plains of Misashi, I'm going back to the tribe in which I came from so many years ago. I wish you all the most happiness...Good bye. Your loyal servant Jaken." Nephra is the first to find it by afternoon the next day but by this time, Jaken is already long gone. Nephra calls the family all to meet at their father's throne as she reads the note out loud to the them all. Zephra takes the note from Nephra, "Let me see that...I don't understand why he would think he's a burden on us." Herosha adds, "He's going to the plains of Misashi where his tribe is? That's stupid, Doesn't he know how dangerous it is to travel to that area? What's he trying to do... get himself killed? He's just a little imp, he can't fight for himself." Nephra scolds Heroshya, "Heroshya, that is exactly the type of talk that made him leave in the first place. " Heroshya defends himself, "What? Is it my fault that he decided to leave and run away?" Nephra: "I'm just saying that based off his letter, he feels useless, comments like that is what caused him to feel this way." Heroshya: " Fine since it's my fault, then I'll go find him and bring him back." Zephra: "She's not saying it's your fault, you're just cruel and heartless all the time, you can't help it." Heroshya: "What!! You're the one always getting him to help you keep your little secrets from father." Sesshomaru: "Secrets?? What secrets do you speak of ?!" Zephra: "Father, don't listen to Heroshya...He has no idea what he's saying." Sesshomaru: "Zephra, If I find out that you have been defiant again....."
Zephra interrupts: "Father ...there are more important issues at hand, we should stay focused on Jaken not me." Rin: (shakes her head as she remembers) " It's my fault, I called him clumsy yesterday...I hurt his feelings." Zephra: "We've got to find him, Heroshya's right....to get to the plains of Masashi is a dangerous trip for a small demon like Jaken, He could be killed." Nephra: "Oh...I can't bear even the thought of him out there all alone." Rin: "I will never forgive myself if he is hurt." Heroshya: "What are you blaming yourself for ? Nephra said it was my fault." Sesshomaru: "Alright Enough, Enough of this bickering back and forth. Heroshya, continue on to the Northern region to obtain the items I've requested, the demon warriors require this; it can not wait. Nephra, Zephra....you will travel together to the plains of Masashi and find Jaken, bring him back here to me directly." The three of them leave to follow out their father's instructions, The girls begin the trip to the plains of Masashi taking the path they think Jaken would have taken. Nephra and Zephra locate Jaken's scent and try to follow it, Zephra comments, "His scent is present but weak." Nephra responds,"He may be very far ahead of us, who knows when he wrote that note." The girls continue to follow the weak scent that Jaken left behind. Meanwhile, Jaken has walked all night and all morning as he thinks to himself: I bet no one will even know I'm missing until one of them wants there dinner or their sword sharpened. They'll probably just get some other demon to take my place and think of me no more. No matter, I will very shortly be back with my old tribe and it will be just like old times...hehe...perhaps they will appoint me leader like before and I will feel important again.. He continues to walk with the staff of two heads in his hand when he suddenly hears a rustle in the trees. Jaken knows that the area is a bit dangerous for small demons but he is determined to make it to the plains of Masashi. He swiflty turns and raises his staff as he shouts, "Who's There!!! Abandon me now or you will feel the power of my staff !!" Before Jaken knows it, a huge demon jumps directly in front of him and knocks the staff to the ground at the same time lifting Jaken up by his shirt and lifting him off his feet. Jaken struggles, wiggling his body and feet as he yells, "Ahhhh, release me at once !!!" The demon replies, "I know you....You are the little demon servant that follows Sesshomaru. So you are here in these woods, with out your master. How fortunate for me." Jaken inquires, "What do you mean fortunate for you??" The demon responds, "Do you see this??" he is still holding Jaken up by his shirt while at the same time pointing to his right side of his face which is badly disfigured and his eye is void of sight on that side. Jaken recognizes him , "Takanji !" He continues, "Sesshomaru did this to me when I merely made a comment about his father's weak nature for falling in love with a mortal woman. You were right there by his side when he struck me, you cheered him on you little...." Jaken interrupts, "Served you right, No one talks negatively about the Great Dog General that way...My master taught you a lesson you won't ever forget." Takanji chuckles sinisterly, "So perhaps he did...now I will teach him one. I will destroy you and leave your corpse at the door of his castle." Jaken is in sudden fear and yells out, "Ahhh...No...Let me go!!" Takanji raises his clawed hand to strike when Jaken replies quickly, "I am no longer Lord Sesshomaru's servant...killing me will do you no good, You will get no reaction from my death." Takanji stops and thinks a moment, "In that case, I will keep you as my slave to carry out my orders day and night." Takanji swiftly flies off with Jaken leaving the staff of two heads on the ground of the wooded area. Nephra and Zephra have been walking for a while, as they continue walking they call out to Jaken, yelling his name in hopes that he will hear them but there is no response. Nephra is worried as she says, "Oh where could he be for goodness sake?" Zephra responds, "We will just keep walking until we reach the plains of Masashi, he's bound to pop up some time." The girls keep moving when Zephra walks right into a trap as a rope ties around her ankle tightly and swiftly begins lifting her up but this does not phase her ....as she is upside down, she (with in mere seconds) lifts her upper body slightly and uses her slash blades to cut the rope causing her to fall but she flips and lands on her feet easily. She and Nephra look up to see where the trap comes from and they notice the rope is coming from the tree. Nephra uses her finger whip and in an instant the power of her whip causes the leaves of the tree to be completely destroyed allowing she and Zephra to see what was hiding behind all those tree leaves. It is a strange owl demon with glowing eyes...Nephra once again uses her whip and wraps it around the owl demon yanking him down to the ground. He falls to the girls feet, Nephra lifts him to face level while he is still wrapped in her whip and asks, "What were you trying to do with that little trap of yours?" The demon replies, "I was trying to catch my next meal...I must eat to survive you know. It is not my fault she was careless and walked into my trap." Zephra replies, "Your next meal huh? You look more like prey than predator to me...You're just a little worthless demon." The demon yell out "WORTHLESS?? HOW DARE YOU!!" Suddenly the owl demon grows to triple his normal size, breaking loose of Nephra's whip as he transforms into a huge, winged owl with a large beak and red glowing eyes. The girls watch calmly as this demon changes in size, Zephra tells Nephra, "Hmmm, didn't see that happening." The girls don't even bother to unsheath their swords as Nephra yells to the demon, "Your transformation is merely for show, If you were powerful at all you wouldn't need to use traps to capture your prey. Now answer me, have you seen a little green demon around these woods?" The demon laughs, "Sure, I have eaten many little green demons." Zephra responds, "Well then, Perhaps I should slit your belly open and see if the one we are looking for is in there." the demon raises his eyes knowing that she may actually do that to him, he transforms back to a small owl demon and gets a bit serious as he replies, "Look, I haven't seen any little green demons. I swear...I don't really pay attention to them, I only trap mice and squirrels." Zephra looks at Nephra and replies, "We're wasting our time with this creature...let's just keep moving." Nephra agrees as they start to walk off together however the owl demon watches them leave and his eyes begin to glow red as he chuckles and flies off. The owl demon flies straight to his master whom is the very same demon that is holding Jaken captive (Takanji ). 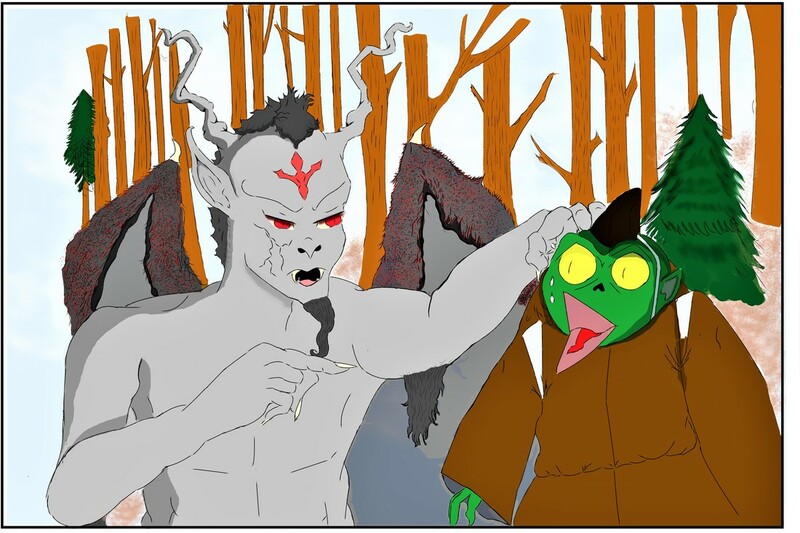 He tells his master that there are two young half demon girls searching for the little green imp demon he is holding prisoner. Jaken is nearby as he is being used to tote items from one location to another, he hears the owl demon inform Takanji that two girls are looking for him and he knows it is Nephra and Zephra. Jaken is so happy as his eyes light up with excitement knowing that Nephra and Zephra care enough to come get him, he is also elated at the fact that he will soon be rescued that he once again blurts out too much information, "Ha, You'll be sorry now....The daughters' of my powerful master, Lord Sesshomaru are coming for me. Let me free now or you will suffer a miserable death at their hands!!" The demon is intriged by this information as he responds, "Hmmm, the daughters' of Sesshomaru you say....perhaps I will get my revenge after all." Jaken realizes what he has just done as he tries to recant, "uh, actually....those may not be Lord Sesshomaru's daughters after all, he would never send them out to search for me." Takanji narrows his eyes, he knows Jaken is lying to protect them so just to be sure, he asks the owl demon, "What do you know about these half demons?" the owl demon replies, "They both were of exceptional beauty and power, master." Takanji inquires again, "I need more details than that, what did they look like?" The owl demon continues, "They were both half demon, one of them had dark hair and dark eyes but the other had silver hair and golden eyes. They asked me if the little green demon had passed through." Takanji is satisfied with this information as he says, "Those MUST be Sesshomaru's daughters, the one with the silver hair and golden eyes has his look. Haha, he must have followed in his father's steps, falling prey to a mortal woman....that would explain the one with the dark hair and dark eyes....yes, there is no doubt those are his daughters." Jaken is very confident of the girls fighting abilities as he explains, "It doesn't matter if you know, you will not be able to defeat them." Takanji responds, "We will see about that." He writes a note and calls to his owl demon servant, "Take this note and attach it on the staff belonging to this little green demon...It was left there in the woods. I want the daughter's of Sesshomaru to see it and know where to find their servant. We will see how far they are willing to go to get him back." The owl servant quickly does as ordered. a few hours pass and the girls continue to walk looking for Jaken trying to catch his scent. Nephra observes, "It will be night soon..Perhaps we should find somewhere to retire." Zephra disagrees, "I'd rather just keep looking, poor Jaken could be in real danger while we're somewhere in a cave relaxing." Nephra continues, "Which is exactly why I say we should keep ourselves fresh and rested. We don't know where Jaken could be or who we may have to fight to get him back." Zephra continues to argue, "But Nephra, we are...." Zephra's sentence is interrupted as she steps on something hard during her walking, she looks down and picks it up. Nephra's says in a worried voice, "It's Jaken's staff, he would have never left this behind on purpose." Zephra notices something else, "There's a note stuck to it." She pulls the small note that's attached and begins to read, "I have your servant, If you want him back alive...continue on this same path and It will guide you to my lair where he is being held." Nephra responds, "Well, It's obvious he has something planned for us." Zephra anxious to find Jaken replies, "Who cares, let's keep going Nephra." The girls continue walking down the same path as the letter instructed them to, only after walking an hour more they reach an area that has a many huge stones on top of each other, the biggest stone directly in front of them having an opening. Zephra notes, "This must be his fort ." They walk through the area it is huge and there are several doors. Nephra and Zephra stand only for a moment looking to see which door to enter when Nephra decides to use her demonic blast using as much demonic energy as she can. The blast is powerful causing each and every door to burst open. When this happens, Jaken is in a cell behind one of the doors; he screams and falls back from not knowing what just happened. Once all the cloudiness and clutter from the demonic blast clears away, Jaken can see Nephra and Zephra as he yells there names in happiness to see them. They also see Jaken and run to his aid but he is in a prison cell as Nephra asks him, "Jaken who did this?" Before Jaken can answer a bright and powerful mass of demonic power is swiftly flying in their direction. Jaken screams again as he sees it is going to hit them, "Look Out...There he is!!" Nephra and Zephra could already sense the attack coming as Nephra once again uses her demonic blast to quickly create a shield for all of them. The demonic attack is avoided but Zephra is now infuriated as she draws her sword in an instant aiming it at the demon and emitting black fire. Zephra's attack came so fast that Takanji avoided it only by mere seconds. The black fire hits some servants that were standing nearby him, They instantly convulse and their bodies turn to ash that falls to the ground and wisps away. When Nephra sees that the demon was able to avoid the black fire she then draws her sword and attempts to emit big, thick ice shards that fly at him with amazing speed and force but Nephra is only able to create a small amount of ice shards because she used much of her demonic energy creating demonic blasts so he also avoids the attacks. Takanji is astonished by their powerful swords and disappears to avoid anymore attacks, realizing these girls will be a challenge to fight head on, he decides he will find a way to capture them when off their guard so that he can take their swords away. Zephra shouts, "You need not waste your time hiding, we can find your rotten stench easily!!" Nephra remarks, "I don't think so Zephra." "What do you mean?" Nephra explains, "Do you not feel anything yet? I think tonight is the Gemini star forming..." Zephra responds irritated, "Oh No ....and we don't have our human weapons." Nephra continues, "It took much longer than anticipated to locate Jaken." Jaken asks, "What will you do? He may kill you both while in your human form." Zephra laughs, "Jaken, You should know better, that would never happen." Nephra is just as optimistic, "Oh well, we will just have to make due, like mother taught us....when you have no weapons, you improvise." Zephra agrees, "Right, but first...we've got to get Jaken out of this prison." Zephra feels the bars; they are made of strong steel as she says, "C'mon Nephra, night time is falling fast... We've only got a few minutes or so before we turn human." Nephra grabs one bar and Zephra grabs the other bar and together they use their demonic strength to bend the bars apart. They struggle a bit but eventually together the bars pull apart allowing an opening big enough for Jaken to exit. Zephra notes, "We would have never gotten those bars apart in our human form." Nephra picks up Jaken's Staff of two heads, "Here Jaken, we found this in the woods." Jaken is overjoyed, "My Staff!! I will need this if I am going to become ruler of the Masashi plains." Nephra's eyes raise as she asks, "Are you still trying to leave us!?" Jaken says, "It's best if I go somewhere that I'm needed." Zephra hits Jaken on top of the head...POP....Jaken yells, "OUCH!! What was that for!!" Zephra yells back, "Nephra and I have come all this way to get you and you are still talking about leaving us!? Would we have risked our lives if we didn't need you and care about you Jaken?!" Jaken lowers his head as he says, "You all will be better off." Nephra inquires, "Will you not...." her sentence is interrupted as she looks at her hands and watches as her claws begin to draw in. She looks over at Zephra and sees that her sister is transforming into full human form as well. Jaken replies, "Oh No, You're human now." Takanji has been secretly keeping his eye on Nephra and Zephra has now seen that they have turned human. He laughs, "Well, Well...isn't this an interesting surprise. I wonder if you are so tough without your demon powers?" Zephra yells out to him, "We're not afraid and we don't need our powers to defeat a worthless demon like you!" The demon replies, "Then allow me to put it to the test." He yells out to his servants..."Seize them!!" The owl demons go to strike, Nephra tells Jaken, "Take cover!" 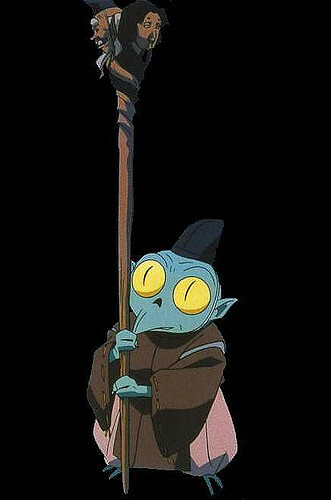 Instead Jaken uses his staff of two heads to help get rid of the owl demons. Nephra and Zephra begin attempting to fight the demons but have no weapons. Zephra notices that there is a chain with cuffs on the ends lying on the ground of the prison that Jaken was in....Takanji normally uses it to chain his prisoners. Zephra grabs the chain and begins to swing it wildly at the Owl demons using it as a whip or nunchaku hitting them and causing them to fall or become badly wounded at the same time utilizing her excellent fight skills to defeat her attackers. Meanwhile Nephra has also found something to use as a weapon as she quickly takes hold of a lit torch that is on the wall keeping the lair well lit. She flicks the touch hard causing the blazing candle to swiftly eject out of it, striking an owl demon like a flying fire ball. The owl demon is caught off guard when the fire lit candle hit a feather from it's wing, catching fire. Nephra, still holding the torch also notices that the bottom of the torch has a sharp, pointy, bottom. She uses this as a dagger, throwing it forcefully and piercing another owl demon. Takanji watching all of this is growing angry seeing that his owl demon servants are unsuccessful in capturing the two girls. He yells out, "Urrrr, I will handle this myself !!" The demon raises his arms and creates a bright ball and aims it. Zephra now in human form is not able to utilize her strong smell and hearing senses, she is still fighting off owl demons and not paying attention as the bright ball is flying right in her direction. Nephra yells out to warn her sister, "Zephra, LOOK OUT!!" Zephra turns but the ball is right there. Jaken yells, "NOOO!!" as he runs and jumps directly in front of Zephra attempting to take the blow to save her. They are both hit with the object that sends them somewhere else. They stand up and Jaken inquires, "OH, We're still alive? I thought we were goners for sure." Zephra and Jaken look around and they seem to be outside in the woods again. Zephra asks, "How did we get back out here?" Jaken replies, "I bet we're still in his lair. This demon is not so strong as he may seem, most of his magic is based on illusions and mind play." Zephra replies, "Well he's doing a good job with the mind play. I don't know how we're ever gonna find Nephra." Suddenly Zephra and Jaken hear loud high pitch screeches, They look over and they see hundreds of demon bats headed straight for them. Zephra yells, "Run Jaken!!" as she also runs trying to avoid the swarm of bat demons. She continues to instruct as she and Jaken run, "We have to take cover somewhere!!" Jaken informs as he runs beside her, " I'm telling you Zephra.... these bats are just illusions, they can't hurt us!" Just as he says that a few catch up to them and one latches on to Jaken's arm and takes a bite. Jaken yells, "AAAHHA" Zephra slaps the bat off of Jaken's arm causing the bat to go flying as Jaken recants, "Then again, I could be wrong, maybe they can hurt us after all. Oh What are we gonna do??!" Zephra orders, "We're gonna fight them off best we can...Get ready and use the fire from your staff, I'll use my sword. I may not be able to use power from it but It's still a very sharp blade." Jaken and Zephra both begin to fight off the bat demons Jaken sprays fire all throughout killing many bat demons while Zephra wields her sword with perfection as she normally would, though she is not able to use the fire element from it. Meanwhile, Nephra is still in the clutches of Takanji who is slowly coming toward her with a evil grin on his face, Nephra begins to back up from him and as she does she steps on a flat, disk shaped stone slab that is on the ground. She picks it up as she rapidly and impeccably flings it at him with much force, Takanji dodges it but it does graze his arm causing a small slash. The demon holds his arm and looks at the wound for a moment but he is not in much pain as he looks back at Nephra and smiles. "You are as dangerous as that smart mouthed sister of yours." he continues to walk toward Nephra as he tells her, "Don't worry your sister and servant are not harmed. You have an opportunity to save them, if you agree to become my wife...I will let them both go free. Is it a deal?" The demon is very close to Nephra now as he attempts to slather her with a kiss but Nephra backs up even more and twists her face at the very thought of his kiss. She knees him, punches him in the face and lastly a full kick to the midsection that knocks the wind out of him and causes him to be knocked across the room. Nephra then asks, "Is that a sufficient answer for you?" The demon is livid as he stands and shouts out, "Fine, you won't be my wife, Then you and your family will die slowly and painfully !!" Instantly he snaps his finger and another blast of demonic light comes her way but she sees it coming and swiftly uses the Armour on her forearm to block it. Nephra becomes angry as she unsheathes her sword and begins walking swiftly towards the demon with sword in hand saying "That's it, I've had enough. I'm going to destroy you right where you stand if you don't tell me where my family is." The demon says in return, "You have no demonic power...haha, how can you destroy me?" Nephra replies, " My father's fang is extremely powerful...this blade will slice you into shreds and I'm a perfectionist with it. So, do you want to die or are you going to tell me where my sister and Jaken is?" The demon believes Nephra's words and as she goes towards him he yells, "Okay wait, I'll show you." He raises his arm and again a very bright light appears behind Nephra causing her to turn hoping she will see Zephra and Jaken there safe and sound but as she turns to look, the demon seizes the moment that Nephra is off her guard throwing a demonic blast at her; before Nephra can react she finds herself inside of a big Orb. Nephra tries to punch and kick her way out of it but the Orb is too strong. She yells, " I should've killed you when I had the chance!!!" The demon responds, "That's right, you should have but you were too worried about your family that you turned your back to me thinking I'm easy to defeat. " Nephra agrees, " You are easy to defeat, had I not turned human this would be over by now but even in human form I could kill you easily." Takanji smiles and then holds up a medium sized, diamond shaped object as a shimmery ray strikes inside the Orb and suddenly Nephra notices her feet slowly fading away and becoming invisible before her very eyes. Nephra eyes raise in shock as she yells out to the Demon asking "What's happening??!" The Demon laughs and explains, "So you think you're better than me?? This device will cause you to slowly fade from bottom to top.....until you completely disappear, Once that happens you will not be able to come back and you will be no more, I will take care of your sister next. How I'd love to see the look on Sesshomaru's face when he finds out his precious daughters have been destroyed by my hand." Nephra is frantic as she unsheathes her sword and tries desperately once again to free herself from the Orb but it does not work; she has no idea how to get herself out of this situation. Meanwhile, Zephra and Jaken destroy as many of the bat demons that they can when Zephra notices something, she thinks to herself: The bat demons seem to be coming from a group of trees in a wooded area.......... Zephra yells out, "Jaken, follow me....C'mon." Jaken asks, "What's going on Zephra?" as he runs behind her still using his staff to fend off bats. She explains as she also continues running toward the trees and fending off bats with her sword, "We've got to find exactly where these bat demons are coming from. You were right about everything being illusion, I think we're still somewhere in that demon's lair but he wants us to think we're in the woods." Jaken follows Zephra as they run straight through the thick wooded area full of trees and branches, Zephra's suspicion is confirmed when she tries to swipe at a tree with her sword and the sword goes right through it without damaging it as if the tree is invisible. They keep running straight through, destroying demon bats as they approach. Eventually Zeprha can see that there is one tree that has a hole in the center of it and the bats seem to be flying out from there. Zephra says, "This tree is real." She uses her sword to chop it and destroy it as she does the scene around them instantly changes before their eyes and they are no longer in the woods but has returned to the dark dusty lair of Takanji. The tree suddenly turns into a stone statue from the lair that is now broken due to Zephra destroying it. Jaken replies, "See, I told you none of this is real." Zephra responds, "Yea okay, You were right Jaken...but this is no time to gloat, we have to find Nephra." Jaken agrees as they start looking around the lair, Zephra comments,"I don't have my smell scene Jaken, You'll have to guide me to find Nephra and the demon." Jaken nods, "I'll try but my smell sense is no where near as strong as a dog demons." Jaken does his best trying to locate the Demon, using his own demonic smell senses but it's not as strong so they take a few wrong turns in the process but they finally can hear Takanji talking to Nephra. Zephra and Jaken slowly peek around the corner and they can see the Demon standing near by and Nephra in the Orb as they listen to him continuing to speak to Nephra. "You should have taken my deal, now you will never see your family again. You will no longer exist in this world." Zephra and Jaken can see that Nephra's body is fading...they look at each other now knowing that Nephra is in serious trouble. Zephra silently motions to Jaken to help Nephra, pointing to the Orb as she then runs with her sword toward Takanji, intent on destroying him. Zephra does not warn Takanji but instead immediately attacks while his back is turned....The demon turns around in time and begins trying to ward off Zephra's attacks. Meanwhile Jaken runs straight to Nephra's aid. Jaken runs to the Orb hitting it and kicking it trying to break Nephra free as he says, "This Orb is impossible to break!!" He notices that half of Nephra's body is faded as he asks her in a worried voice, "Nephra...why are you disappearing? What will happen?" she tells him, "That device the demon is holding is causing me to fade, he said that once I disappear completely, I will be gone forever." Jaken's face shows shock and worry for Nephra, he looks back and he watches for a moment while Zephra fights the demon. Jaken focuses on the device that is still in the demon's left hand while he is blocking Zephra's strikes with a weapon of his own in his right hand. Jaken turns back to Nephra and assures her, "Don't worry, I won't let you fade away...I'll get that device." Jaken knows this is a good time to attack and get the device because the demon is preoccupied with Zephra who is giving him a good fight. The demon attempts several times to trap Zephra into an orb also as he shoots blasts of demonic light from his eyes at her but Zephra skillfully jumps, circles and avoids his demonic strikes. The demon is becoming frustrated that he is having so much trouble and unable to attack a human girl. Jaken runs, Jumps up and chomps down hard, biting the demon on the left hand. The demon drops the device as Jaken had hoped but he is flung by Takanji and hits the ground hard. Jaken is so desperate to save Nephra that he jumps up immediately and runs to the device. It is steadily glowing and shooting out towards the Orb Nephra is in. Jaken quickly uses his staff of two heads to break and destroy the device. When he does this, Nephra's fading ceases and she comes back into full body again. Jaken is elated as he laughs, proud of his bravery..."hehehe, I did it!! I'd like to hear those demons call me worthless now!!" The demon is furious that the device has been broken as he yells, "You scrawny toad...I"m going to destroy you...." Jaken yells in fear..."AAAAH." As he scrambles and tries to run but Zephra is quick to finish her attack as she wields her sword and jams the sharp blade into the chest of the demon. He roars in pain as Zephra informs, "When this ends, you will be the one destroyed." The demon responds, "I've heard enough of your remarks girl, Take This !!!" He strikes a vicious,deadly strike at her but Zephra is so skilled at swinging and blocking with her sword that she causes his demonic strike to ricochet off her blade and hit him instead. The demon bursts into pieces and is completely destroyed by his own power. Once this happens, the hard Orb also automatically bursts being destroyed along with the demon who had created it allowing Nephra to be free. Zephra and Jaken run to Nephra's side helping her up as Zephra asks, "Nephra, are you okay?" Nephra responds, "I'm fine, thanks to you." She looks at Jaken and says, "and you too Jaken, If you hadn't gotten that device when you did, I would have been gone from this world." she continues, "See Jaken, we need you...You can't leave us, besides mother and father would be filled with grief if you didn't come back." Jaken inquires, "Do you really think that Lord Sesshomaru would be upset about my leaving?" Zephra adds, "Well, you know father...He'd never show it or say it but he would be beside himself with grief, We all would miss you so much... we want you to come home Jaken." Jaken lowers his head in thought for a moment and then lifts his head looking at Nephra and Zephra and thinking that he practically raised them, He thinks he would miss them too much also...he responds, "Alright, then hear this...no more complaining when I make a mistake or when I let too much information slip out or when I over cook your dinner or when I...." Zephra interrupts, "Okay, Okay, this list could go on and on." Nephra smiles as she nudges her sister, "Quit it Zephra.....Jaken we won't ever make you feel unwanted ever again. Now let's go home." The three walk back to the castle and by the time they reach, it is just about morning again and the girls are returning to demon form, Rin and Heroshya are right outside of the castle as Jaken, Nephra and Zephra over hear Heroshya speaking to their mother, "Don't worry lady Rin, I will find them...I'm sure all is okay." Zephra yells out to them, "We have one rough night and you guys get all worried." Rin is so relieved to see her daughters as she replies to herself, "Oh thank goodness you girls are safe..." she then notices Jaken with them as she yells out, "Master Jaken, You're back!!" She rushes over and lifts him off his feet as she hugs him, he struggles, "Rin...Stop it Now...Enough of that." she puts him down and says, "I'm so glad that you've come back." POP....Heroshya bops Jaken on the head...Jaken yells out, "Hey...What was that for, huh!?" Heroshya responds, "Do you know the chaos that you caused around here? Why would you leave like that? Have any of us ever treated you like we didn't want you around?" Jaken responds, "I thought I was doing everyone a favor...I never knew you would all act this way over my leaving." Heroshya responds, "Well now you have to go in there and talk to father, he sent his daughters out to a dangerous area to find you and bring you home. He'll want an explanation from you." Jaken takes a deep breathe and goes inside the castle to meet with Lord Sesshomaru, Rin yells to him as he heads in, "Good luck Master Jaken!!" Jaken looks back confused, "HUH ?? !....Good luck??" He takes a big gulp as he continues nervously to Lord Sesshomaru's throne, there Sesshomaru sits as Jaken replies, "I..I..I'm Here Milord." Lord Sesshomaru stands up and asks, "Jaken...are you not content being in my service?" Jaken bows as he responds, "Oh it..it's not that Milord, Not at all...I just thought that I am not worthy of you or your family anymore." Sesshomaru responds, "If you were unworthy, I would have destroyed you long ago." Jaken agrees, "Yes, of course master Sesshomaru." Sesshomaru continues, "Jaken come closer." Jaken does as ordered and comes closer, bowing once again. Sesshomaru again orders, "Closer." Jaken goes very close and says, "Oh Lord Sesshomaru please forgive my foolish act." as he opens his arms hoping to give Lord Sesshomaru a huge hug....POP....Sesshomaru bops Jaken on the head as he informs, "Do Not dare cause this family distress again!!" Jaken replies in pain, "Yes Milord." When Jaken returns to his quarters he can still feel the sting of three sharp bumps to his head from when he was hit by Zephra, Heroshya and Lord Sesshomaru but he smiles as he thinks: hehe, it was all worth it, I have a family and they never want to see me go away from here. Just then he hears Zephra calling him...."JAKEN!!" as he thinks again: Well, I guess it's back to being the under appreciated but well needed servant.